You'll be £12.99 closer to your next £10.00 credit when you purchase War on the Eastern Front. What's this? Order within the next 30 minutes to get your order processed the next working day! Dawn on Sunday 22 June 1941 saw the opening onslaughts of Operation Barbarossa as German forces stormed forward into the Soviet Union. Few of them were to survive the five long years of bitter struggle. A posting to the Eastern Front during the Second World War was rightly regarded with dread by the German soldiers. They were faced by the unremitting hostility of the climate, the people and even, at times, their own leadership. They saw epic battles such as Stalingrad and Kursk, and yet it was a daily war of attrition which ultimately proved fatal for Hitler's ambition and the German military machine. In this classic account leading military historian James Lucas examines different aspects of the fighting, from war in the trenches to a bicycle-mounted anti-tank unit fighting against the oncoming Russian hordes. 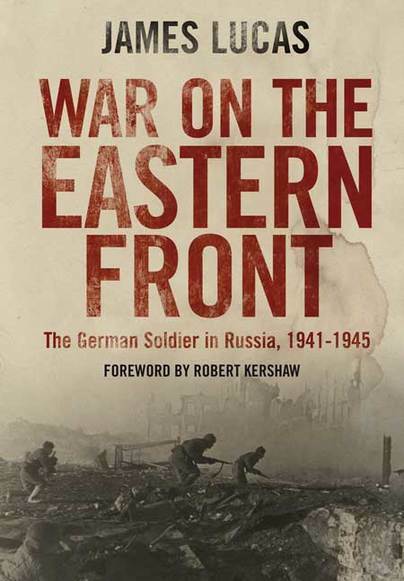 Told through the experiences of the German soldiers who endured these nightmarish years of warfare, War on the Eastern Front is a unique record of this cataclysmic campaign. A very enjoyable book and I have many gleaned much new information from it over the course of its 214 pages. The book isn’t chronologically arranged by dates, but is instead divided into chapters which cover topics relevant to the campaign in Russia such as the terrain and climate, Partisan warfare and the effectiveness of the assault gun batteries. The writer is able to describe his subject in enough detail so as to make the book comprehensive, but without labouring the point meaning the text flows nicely keeping it interesting for the reader. Also included in the text are many excerpts of veteran testimony which really help set the scene (the stopping of a Russian assault using Nebelwerfer batteries is very illuminating and paints a vivid picture of the deployment and effectiveness new shock weapon). If you need an easily accessible but informative book on the the war in the East which is backed up with information and testimony from both sides of the conflict, then this is the one for you. JAMES LUCAS fought with the British infantry in the Second World War. After the war he developed close contacts with German ex-servicemen, enabling him to undertake the extensive research that underlies the success of his many books. Lucas received international acclaim as one of the leading experts on all aspects of German military conduct in WWII.